A wise choice for basement flooring should be completely waterproof. With all the pipes, sinks, toilets, bath tubs, showers, refrigerators, hot water heaters, water storage tanks, washing machines, and other plumbing in the house, there's going to be a flood in the house sooner or later- even if the basement foundation does not leak. When this flood occurs, water is going to flow downhill and into the basement floor. If your basement flooring isn't ready to rise to the occasion, it's going to be you and your bank account that pays. 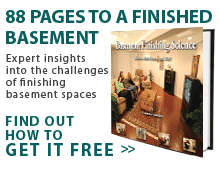 Total Basement Finishing offers affordable, lasting solutions for basement flooring. Read on or contact your local dealer to find out more, and schedule a free estimate for the best basement flooring for your home! Total Basement Finishing's ThermalDry® basement flooring is perfect for the job. Their ThermalDry® Floor Matting has recently won a CQIAgold medal award for quality and innovation in the field for its performance and evolution of the basement flooring industry. This mold-resistant inorganic basement flooring product is completely waterproof and is designed to last twice as long as other floorings, making it a practical choice for the basement environment. These floor tiles sit on raised pegs, creating an airspace beneath the tiles that allows for air movement and makes the surface of the tiles as much as ten degrees warmer than the basement floor. ThermalDry® floor tiles are engineered for ease of installation and replacement- if a floor tile becomes worn or damaged for any reason, it can easily be removed, relocated, or replaced even by a novice homeowner. These tiles are durable, easy to clean, and all ThermalDry® floorings are ready to use immediately after installation. 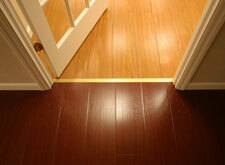 MillCreek flooring provides the beauty of natural wood with a completely inorganic design on the basement floor. Its durable, anti-slip surface cleans easily, resisting stains from paint, marker, spilled food, and a variety of other materials. It is more forgiving of falls than wood or tile, and it comes with a completely inorganic design that contains no formaldehyde and will not support the growth of mold, bacteria, or rot. MillCreek is durable and built to last! Both MillCreek and ThermalDry® flooring can be used immediately after installation and are perfect with radiant heat flooring systems. They both come with a written warranty, and all Total Basement Finishing dealers are ready and willing to provide free, no-obligation estimates on all products. If you're interested in a quality basement finishing, call or contact us today for a Free Estimate!